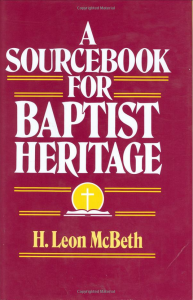 Leon McBeth is best known as a Southern Baptist Church historian and primarily for his book, The Baptist Heritage (Broadman, 1987). In 1990 Broadman Press printed this follow-up to that book. McBeth explains in the preface, “Over the years when I would share an unusual anecdote, a choice quotation, or a first-hand account of some event in Baptist history, many of the students showed keen fascination. Countless times I have been asked some version of the following question, ‘Can you tell me the name of the book where you found all of these stories?’” This book is therefore a source book for those stories and anecdotes that compliment McBeth’s well-known text. He begins with John Smyth and Thomas Helwys in England and then with Roger Williams and John Clarke New England, continuing into the 1980s.